Nannie Huddle (1860-1951) was born in Mobile, Alabama. She was married to the historical painter William Henry Huddle who critiqued her first painting in the 1870's. Nannie's husband died prematurely in 1892 and she withdrew from painting until 1894 and shortly thereafter went to New York at the Art Student's League to study with William Merritt Chase, Wayman Adams and Marshall Troy. After returning to Austin, Texas her reputation grew and was appointed by Governor Joseph Sayers as a teacher for the School for the Deaf. She held that position until her retirement in the 1940's. Nannie Huddle is known as one of the earliest bluebonnet artists, if not the first. She also painted portraits and studied sculpture under Elisabet Ney for 4 years at the turn-of-the-century. Huddle was a member of the Austin Art League; Southern States Art League and others. 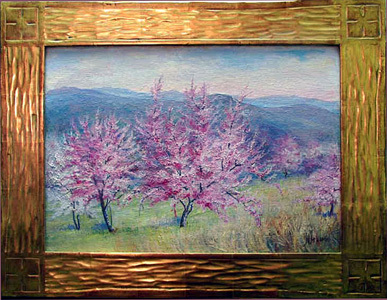 She exhibited at the Edgar B. Davis Competition in 1927 at the Witte Museum; The Annual Texas Artists Exhibition in Fort Worth in the late 20's and the Texas Federation of Women's Clubs and others.